It's About Time, Teachers! : Higher Order Thinking Skills and much more! Higher Order Thinking Skills and much more! Last week, I blogged about Bloom's Taxonomy and Higher Order Thinking Skills (HOTS). (See April 2, 2012.) My friend, Andrea, over at One Teacher's Take...is Another's Treasure commented that she also uses Webb's Depth of Knowledge (DOK) Levels and Marzano's Dimensions of Thinking, both of which are new to me. So, I immediately googled them. Here's what I found. . .
What I like about Webb's model is the 4 levels versus Bloom's 6. It's always nice to condense things, isn't it? At least in my realm of preparing dozens of lesson plans each day, less is more! The 4 level descriptors (the inner circle) boast newer and somewhat clearer concepts. Then my eye wanders over the outer circle. Ouch! Another sea of verbs to swim through. The 4th level, presumably the quarter in which we strive to spend most of our time, is curiously short on verbs compared to the other 75%. Are those 8 verbs/phrases just more succinct? Or, do they reflect the limitations foisted upon teachers by the Common Core of Teaching Standards, standardized testing, and uniform time lines? Surely that triad has bearing on it. Perhaps there is more to be considered, however. Is the 4th level truly where teachers strive to be? I hope, in my heart of hearts, that the answer is YES. However, it is possible that some, if not many, teachers find little motivation to work on level 4. Their efforts are not evaluated by standardized tests, depriving them of extrinsic approval. Paychecks remain static whether teachers push their students toward extended learning or not. Indeed, rewards are esoteric. Certainly the dedicated, professional teacher experiences intrinsic satisfaction. S/he may even be fortunate enough to receive accolades from students, parents, colleagues, and/or administrators. Is that enough? In a future blog, I'll discuss Marzano's Depth of Knowledge Levels. Until then, I'd love to hear your thoughts about teaching HOTS. 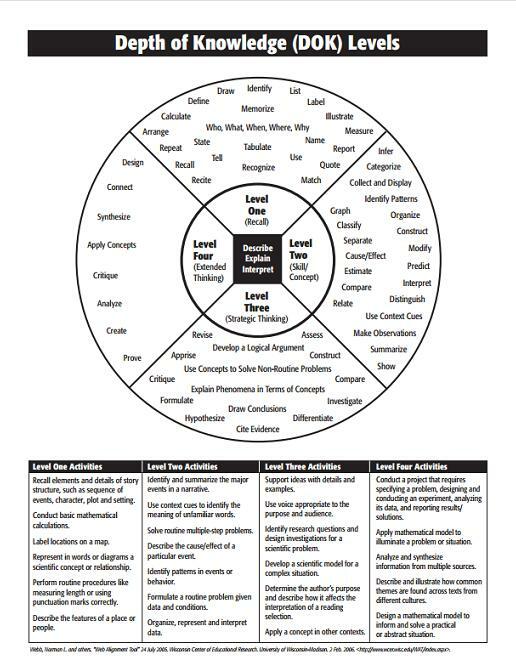 Barb, I just found your blog through the K-2 Linky Party, and this post on Webb's DOK Levels was really helpful! I was just wondering what grade you teach now? Do you ever bring in any of your clocks for the kids to see? Do you have any talking clocks? If you have a moment, I'd love it if you stopped by my blog! I'm so pleased to meet you. Thanks for telling me how you found me. I always like to know that. Glad the Webb's DOK levels were helpful. Stay tuned; I'm going to post about Marzano's Dimensions of Thinking, too. But I got sidetracked by National Poetry Month. I've been teaching enrichment to 2nd - 5th graders since 2000. Along the way, I grab a few extraordinary K & 1 kids. I taught 1st grade for 17 years. It's still my favorite grade, although I have a passion for gifted and talented children. They stretch me in so many ways. I have not brought any clocks to school to show my kids. Hmm. I'll have to think about that. I do not have any talking or chiming clocks. When you fill your house with more than 70 ticking machines, that cacophony is enough. In fact, my children complain about all the ticking when they come to stay for awhile. When we 1st bought our little lake home 10 years ago, my husband & I went to a clock store in Zionsville, IN. It's a perfectly charming place and we bought thousands of dollars worth of clocks, gasp! There were so many interesting ones, we just couldn't stop. We even bought 2 clock tables. It's a fun hobby and it has made it so easy for my hubby and friends to give me gifts on my birthday. Always thrilled to have another clock! I'm heading over to your blog now. Wow, how interesting! I'm not sure I know what a "clock table" is, but it sounds very cool. :) Because I'm blind I use talking clocks all the time. I was so embarrassed when the chime on my watch went off while we were visiting Canterbury Cathedral in England! If you can imagine a rooster crowing with those vaulted ceilings... my husband was not happy with me that day. Thanks for stopping by my blog! Easter Sale -- 15% off EVERYTHING!